Among NFL receivers, Jerry Rice unquestionably holds all-time G.O.A.T status. 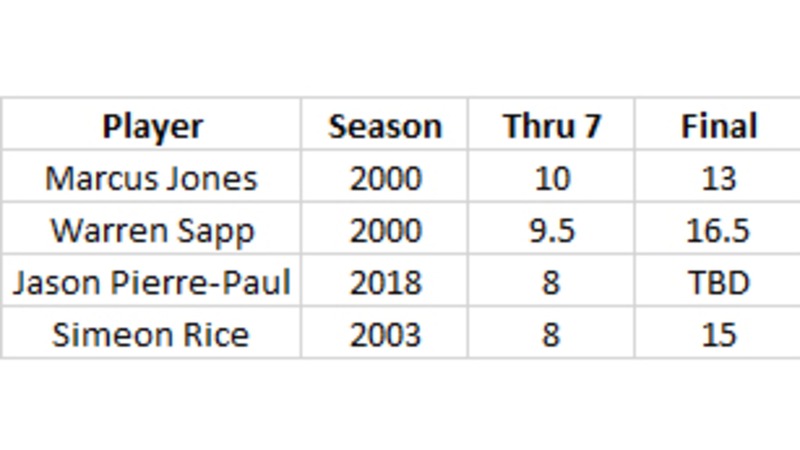 The Pro Football Hall of Fames has welcomed such greats as Terrell Owens, Randy Moss, Marvin Harrison and Cris Carter in recent years, but none finished within 6,000 yards of Rice's career 22,895. 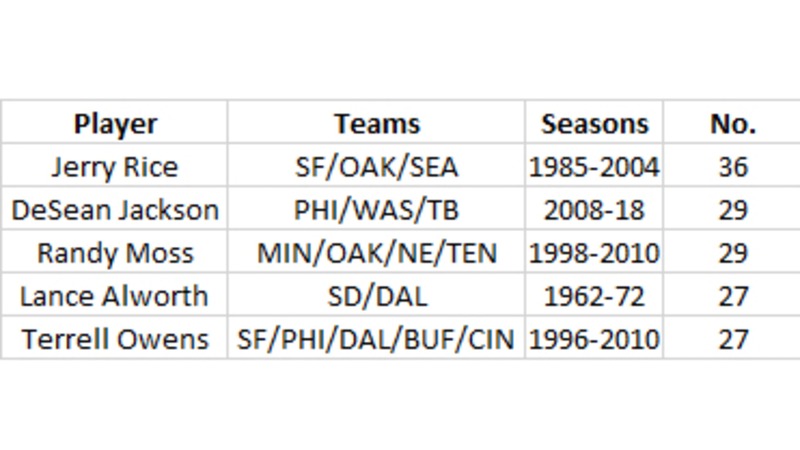 Moss had an incredible 156 career touchdowns…and still fell 41 short of Rice's 197. And so on. However, one of Rice's records did actually fall on Sunday, and it now belongs to Tampa Bay Buccaneers big-play specialist DeSean Jackson. Jackson caught a 60-yard touchdown pass during the Buccaneers' furious comeback attempt in Cincinnati, which happened to be his 24th career score of 60 or more yards. No one has ever had more. Until that play in the second quarter on Sunday, Jackson had shared the record with Rice. 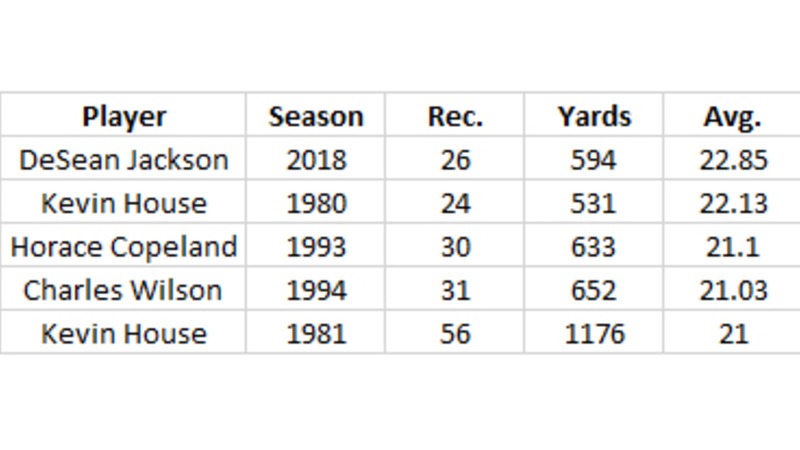 Jackson still has some work to do to catch Rice in another, similar category: touchdowns of 50 or more yards. However, his long score in Cincinnati did allow him to catch another Hall of Famer in Randy Moss. Jackson's touchdown was the 61st of his career. Incredibly, his 61 touchdowns have covered an average distance of 44.5 yards per score. 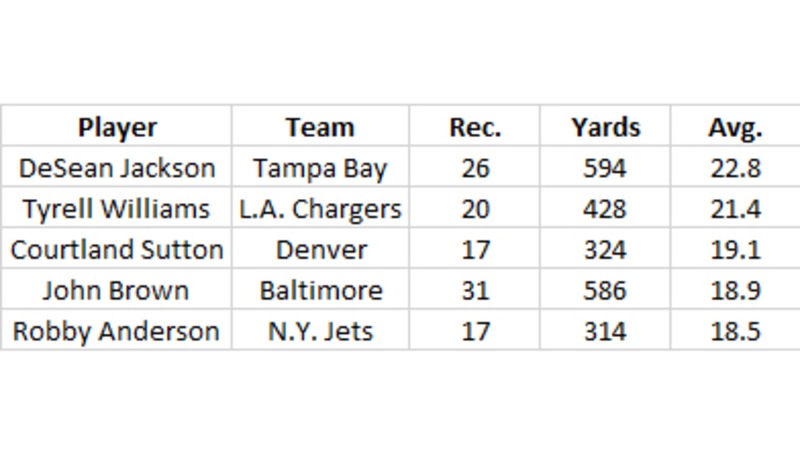 Of all the players in NFL history who have found the end zone at least 60 times, Jackson has the longest average distance of his scores. Jackson had three catches for 68 yards in Sunday's game, averaging 22.7 yards per catch, which is almost exactly his average for the season as a whole. 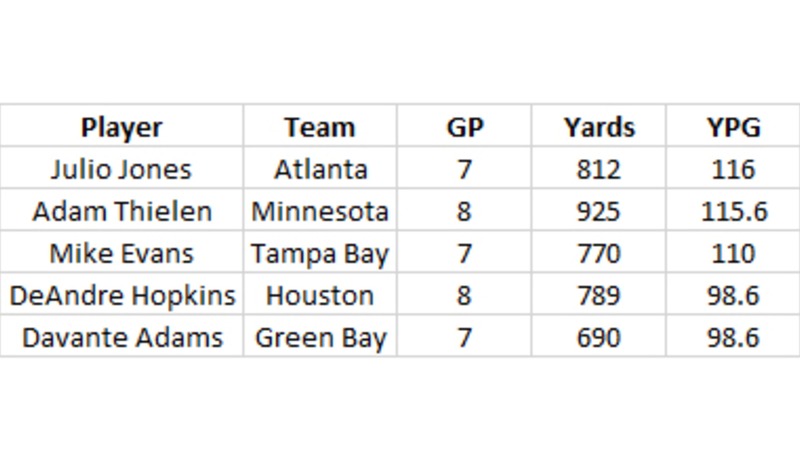 That is the top mark in the NFL, and he is one of just two qualifying players averaging more than 20 yards per grab. 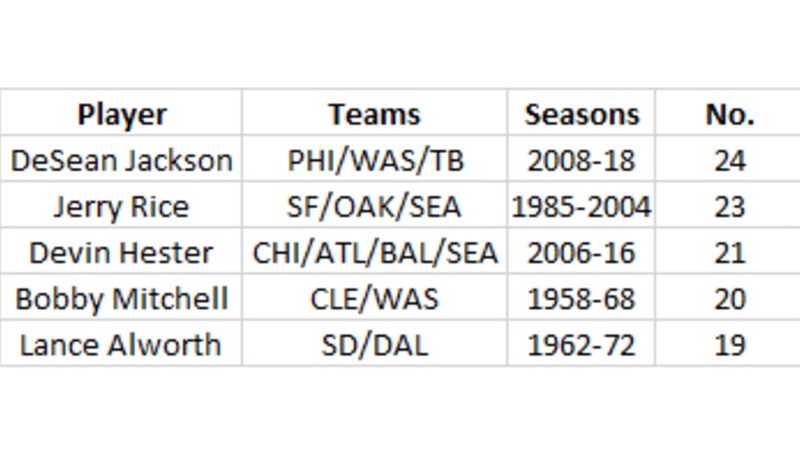 Jackson is on pace to break the Buccaneers' single-season record in that category. 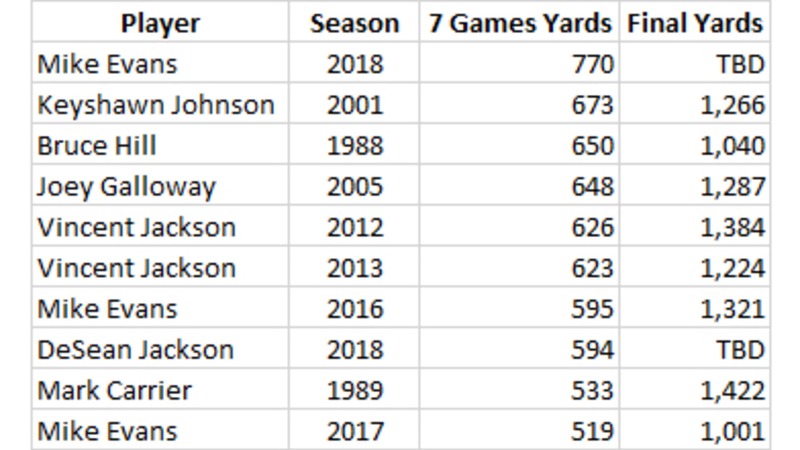 He has a good shot to be the first Tampa Bay player to average more than 20 yards per catch in a season with at least 20 receptions since 1994. Mike Evans led the Buccaneers in receiving on Sunday, catching six passes for 179 yards. Last week, Evans broke the franchise's all-time record with his 16th career 100-yard game, and now he has 17, including four in seven outings this year. Evans is averaging 110.0 receiving yards per game in 2018, which is the third-best mark in the NFL. The biggest chunk of Evans' 179 yards in Cincinnati came on a career-long 72-yard touchdown grab in the fourth quarter. That was the 36th scoring catch of his career. Only three players have tallied more touchdown receptions than Evans since he joined the team as a first-round pick in 2014. Evans' 770 receiving yards is the most any Buccaneer player has ever had through the first seven games of a season. He is the first Tampa Bay pass-catcher ever to average more than 100 yards per game this far into a season. Evans is on pace for 1,760 receiving yards, which would demolish Mark Carrier's long-standing team record of 1,422 yards, set in 1989. Carrier had 533 yards through his first seven games that season. 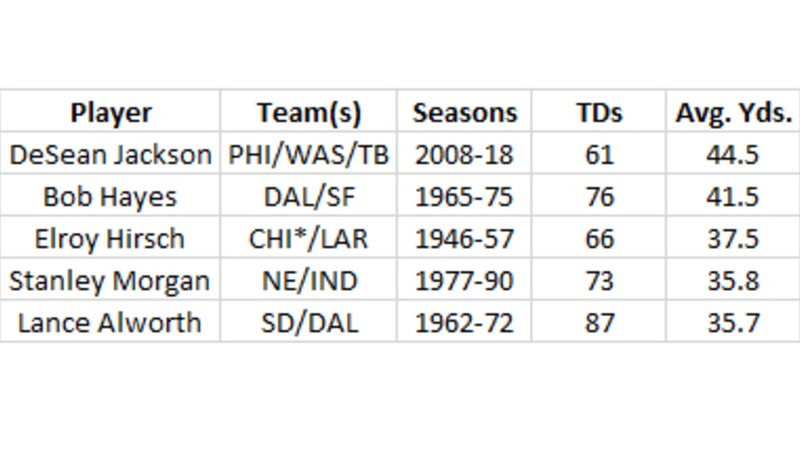 Here are the top 10 totals in team history through the first seven games of any season, and where each receiver finished by season's end. Jameis Winston threw for 276 yards in Cincinnati before being replaced after his fourth interception of the game. 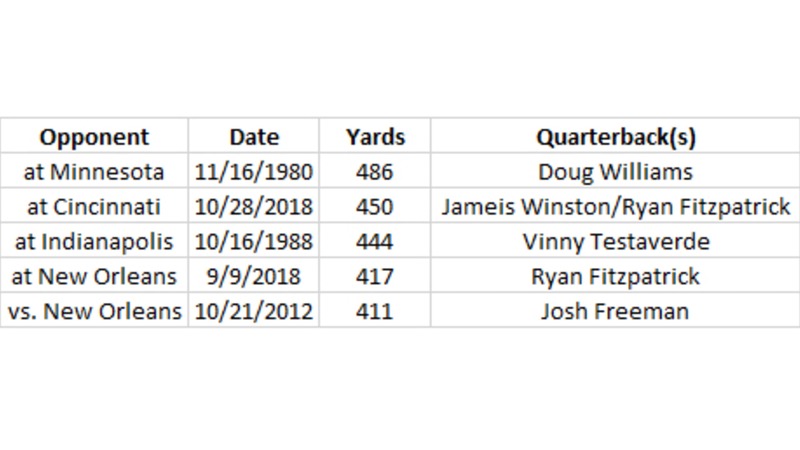 Before he left, Winston pushed his career passing yardage total to 12,817, which moved him past Doug Williams (12,648) and into fourth place in team history. He is just 153 yards away from moving past Trent Dilfer (12,969) into third place. Yesterday was Ryan Fitzpatrick's 3rd game of the season with a passer rating over 140. 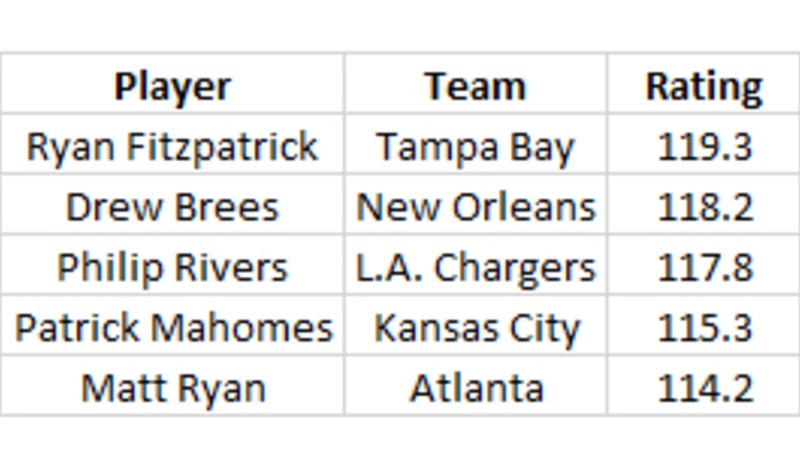 Though Winston started the last three games, Fitzpatrick has still played enough this season to qualify for the NFL lead in various passing categories. And, at 119.3, his passer rating in 2018 is at the top of the list. The combined work of Winston and Fitzpatrick on Sunday led to a net total of 450 passing yards for the Buccaneers. That's the second-highest total the team has ever had in a single game. Led by Peyton Barber's 85 yards on 19 carries, the Buccaneers also picked up 126 yards on the ground in Cincinnati. That led to a final net yardage total for the game of 576, the most Tampa Bay has ever put up in a single outing in its 43-season, 667-game history. 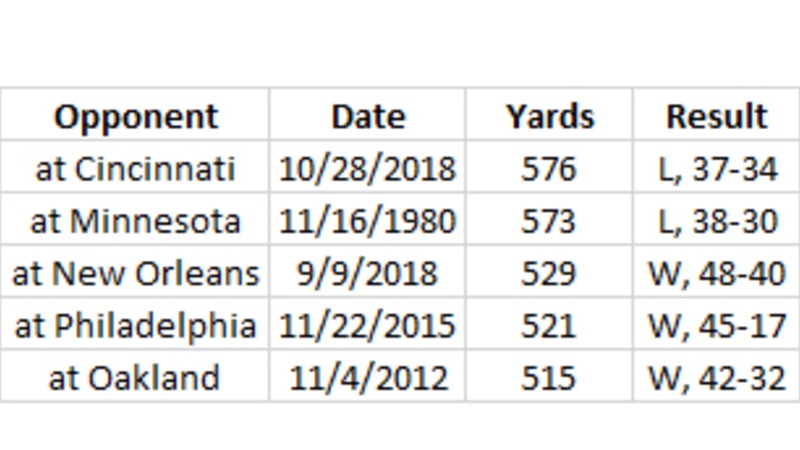 The Buccaneers have eclipsed 500 net yards of offense in three different games this year; in their first 42 seasons, they had a total of six 500-yard games. The Buccaneers piled up 333 of those 576 yards in the second half on Sunday as they tried to rally from a 21-point deficit. Alternately, Tampa Bay's defense tightened up in the second half; after allowing the Bengals 307 yards before halftime, they gave up just 95 more after the break. One of the standouts in that second half for Tampa Bay's defense was defensive end Jason Pierre-Paul. Pierre-Paul accounted for both of the Buccaneers' sacks of Andy Dalton on Sunday, marking the sixth consecutive game in which he has recorded at least oneQB takedown. That ties the franchise record originally set by Simeon Rice in 2002, from Oct. 20 to Dec. 1. Pierre-Paul has the longest active streak of games with a sack in the NFL, one ahead of the L.A. Rams Aaron Donald, who extended his own run to five games on Sunday against Green Bay. The longest such streak by any player in the NFL this season belongs to Minnesota's Danielle Hunter, who had one in each of the Vikings' first seven games but saw his streak end this weekend against New Orleans. Pierre-Paul's two sacks on Sunday gave him a team-high eight for the season. That is currently tied for the second-highest mark in the NFL, behind Donald's 10. 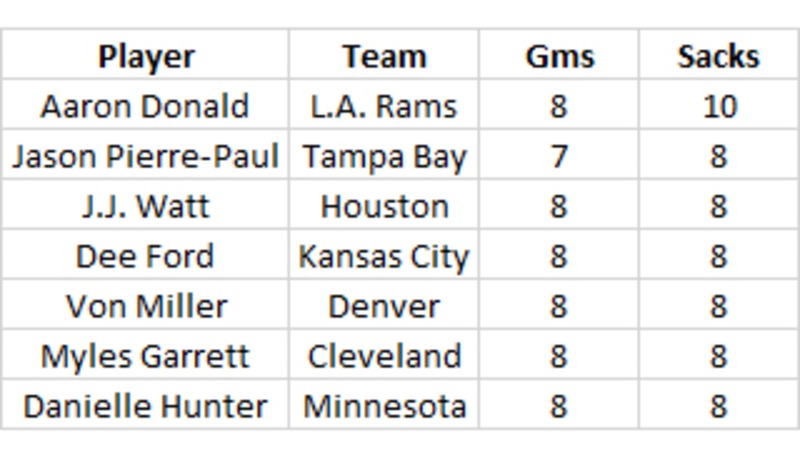 Donald has played one more game than Pierre-Paul, as the Rams have yet to have their bye week. 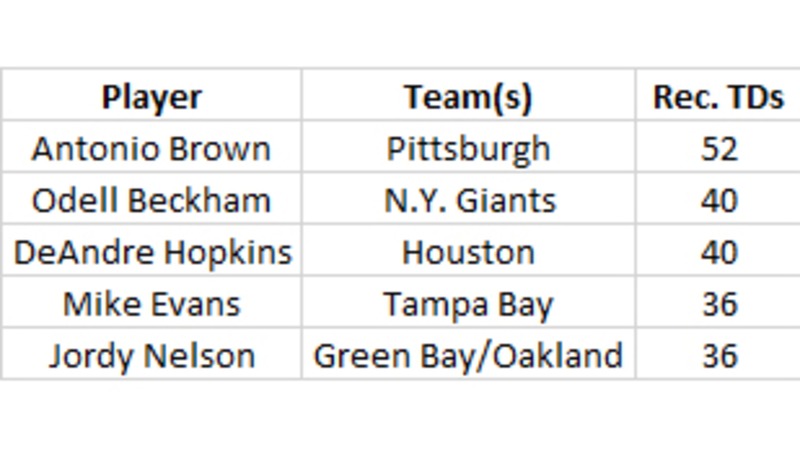 In fact, Pierre-Paul is the only player in the NFL with at least eight sacks whose team has only played seven games. Pierre-Paul is on the verge of breaking a long drought for the franchise. Tampa Bay hasn't had a player hit double digits in sacks in a season since Simeon Rice had 14.0 in 2005. Pierre-Paul is just the fourth player in team history to have eight or more sacks through the first seven games of the season. The other three all cleared 10 with ease by season's end.